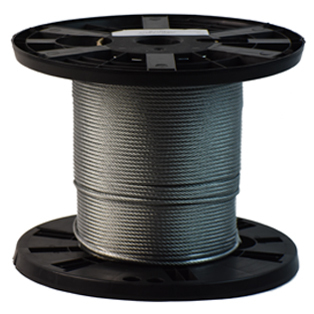 Our wire rope (also known as aircraft cables, wire cables, or steel wire) are made with super high strength and durability, which come in many varieties of stainless steel and carbon steel including coated, non-coated, galvanized. Wire rope are commonly comprised of wire strands that form a helix pattern with a wide variety of uses, including marine, construction, architectural and retail uses. US Rigging offers many varieties of stainless steel or carbon steel wire rope including coated and non-coated wire rope. Mil-Spec wire for aircraft control, or commercial grade wire rope is available in your choice of the 1x19, 7x7 or 7x19 class. Other grades and constructions also are available. US Rigging is pleased to be a leading wire rope distributor and wire rope supplier in the United States. You can rely on US Rigging as your premier wire rope supplier as we offer professional recommendations from our sales team, and offer competitive pricing.